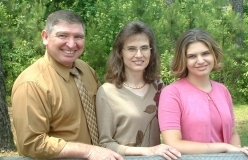 The Fred Kindhart family have been missionaries to Mexico with Macedonia World Baptist Missions since 1985. We have had the honor of seeing many souls saved and several Churches planted, to God's honor and glory. Our goal is to show you Mexico and the great harvest field of over 100 million souls and how our family has and is, having a part in reaching Mexico and the world with the gospel. People often ask how they can help in reaching Mexico and the World wth the Gospel. We will share some ideas and would be glad to hear yours. Since September of 2004 I have had the honor of being the Field Director for Mexico with MWBM.